Raymond Chaillan was born in Nice in 1935, and was raised in Barrême, where his grandfather kept lavender fields and bee hives. In 1962 he went to work at Antoine Chiris in Grasse, where he was eventually promoted to perfumer. In 1969 he went to work for Roure Bertrand Dupont in Paris, and later he worked at Firmenich and Dragoco. 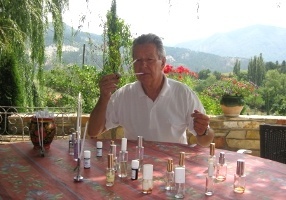 In 1988 he became Director of Perfumery Research at J&E Sozio, and then in 1993 the Director at Argeville. He was President of the Société Française des Parfumeurs from 1995 to 1997, and still participates as a member of the Comité Directeur. Raymond Chaillan is the father of Jean-Marc Chaillan. Note: image courtesy of Raymond Chaillan.